The 2017 election was tedious, depressing and unnecessary. It was an opportunistic move by the PM who calculated the Tory vote would be strengthened by ex-UKIP voters and Labour weakened by Jeremy Corbyn’s left wing leadership. She was wrong on both calculations. Personally, I struggled to identify what this PM had achieved to deserve “landslide” win. Labour had a good campaign with Mr Corbyn broadening his appeal amongst young floating voters with a promise to end university tuition fees. 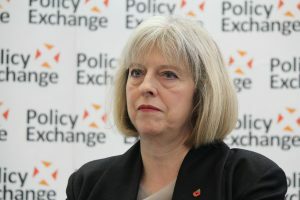 The Conservative manifesto and campaign seemed vague, accident prone, lacking specific promises with reversible moving parts. There did not appear much commitment to the Conservative agenda. It seemed the Tories were taking voters for granted, assuming support. The Conservatives will need the DUP to achieve a working majority but this is a weak government with a tiny single digit majority (4 majority), resembling previous minority governments. The size of the parliamentary majority makes tough legislation difficult to get through the Commons, an “every vote counts” situation that risks votes of no confidence. The PM position is uncertain and unlikely to last to 2022. Part of the problem is Theresa May requires credibility for the Brexit negotiations which start in 9 days. (This might be delayed again). The form of UK’s “Brexit” plan, a “hard Brexit” and out of the EU’s single market will be revisited. The austerity programme / budget deficit reduction plans could be pushed out again. 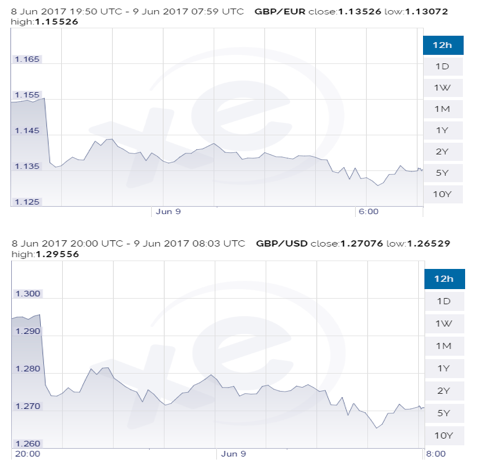 A period of sterling weakness, possibly (£/$1.20/ €1.10) and BoE monetary reticence. So the political surprises, polling predictions, betting mis-pricings of 2016, were not an aberration. The 2017 UK election result, a “hung parliament” was not predicted. Elections / referendums are poor “binary” events, where a “bad” outcome creates significant short term downside risks. But a “good” outcome, gives investors what they already have. Given the high probability of a Conservative government (1/11 odds), the UK capital markets largely priced in this result, yesterday. The probability of a hung parliament (11/2 odds) was a “tail risk” that investors ignored. Now it is reality, it could take a week for the new Conservative/ DUP government to take shape, it could require a formal coalition. The internal party and negotiation between the parties starts only now. With UK equities near record highs, is some nervousness called for? The careful approach is to concentrate on reliable earnings growth, inexpensively valued companies and domestic companies likely to benefit from Tory corporation tax cut promises. The tax cut trajectory is for a rate of 17% in 2020 from 19% now. A re-run of very weak sterling is likely to boost the 15 large companies at the top of the blue chip index (Astra Zeneca, BATS, BHP Billiton, BP, Diageo, GSK, HSBC, Imperial Brands, Prudential, Reckitt Benckiser, Rio Tinto, Royal Dutch Shell, Unilever, Vodafone) which largely determine the index direction and movement. Companies including Sterling weakened sharply post the exit poll release at 10pm last night. Air Partner is a UK based global aviation services group providing aviation solutions across aircraft charter, sale & purchase, marketing, specialist travel management, aviation safety and emergency planning with a commitment to 24 hour flight operations. Demand for Air Partner services comes from the sports sector, typically premier League clubs, major cycling events, political events such as referendums and general elections. The main business, generating c. 90% of operating profit is the Broking division, comprising a) Commercial jets b) Private jets and c) Freight. The other business is Consulting which has been built via acquisition. The board has attempted to shift away from volatile aviation chartering/ broking services opening Consulting and Training following the acquisition of Baines Simmons in August 2015 (in-house training) and Clockwork Research (fatigue risk management) in December 2016. Shortly after the acquisition, In January 2017, the shares were split 1 for 5 to improve liquidity. The board reported significant EPS growth in 2017 (underlying EPS +10.2%) with underlying profit before tax up 17.2% at £5.1m. For FY2018 the current expectation is for earnings growth of 44%. Consensus forecasts envisage improving profits in FY2018 (the current financial year). Air Partner is a beneficiary of general elections, which increase demand for aircraft charter services from politicians, strategists, media etc. Earning growth is accelerating. Air Partner is can broaden its service offering to its existing client base whilst adding new carrier clients. Competitive pricing pressures from other air charter providers, is likely to increase as EU growth accelerates. Beneficiary of UK tax cut promises. Mercantile Investment Trust is a leading UK equity trust with assets in excess of £2bn and over 130 years in existence. The trust’s focus is on UK companies, outside the FTSE 100 with established track record and significant growth prospects. The trust typically invests mainly in FTSE 250 companies. Mercantile Investment Trust has low annual management charges of 0.4% and operating/ administrative charges of 0.08%. The board has a gearing policy to operate within a range of 10% net cash to 20% gearing. The dividend policy for 2018 comprises three payments of 10.5p with a variable final dividend. According to the 2017 annual report (mercantile has a 31st January financial year end) the trust reported 5 year net asset growth of 102.3% against the benchmark return of 99.7%, however over 10 years, net asset growth is 91.3% v ten year benchmark gains of 112.8%. The board noted that over H1 2017 its portfolio was incorrectly positioned for the EU Referendum on 23rd June. Nevertheless the board outperformed during H2 2017 with net asset value (NAV) per share rising 3.06% to 1921p by FY17. A Tory government could lift expectations of lower corporate taxes. In November 2016 the PM promised to offer the lowest G20 corporation tax rate by 2020, the current expectation is the rate will decline to 17% by 2020 from the current level of 19%. This is positive for UK midcaps. Consensus profit estimates; Mercantile I.T. There are no consensus forecasts for Mercantile Investment Trust. Large 12% discount to net assets per share of 2166.7p (7th June 2017) is at the upper end of the normal discount to NAV of between 8%-11%. The Board repurchased 9.4% of ordinary share capital via a share buyback program out of a total buyback authorization of 14.99% of share capital to be held in Treasury or cancelled at a later date. We expect further buybacks up to 14.99% over FY18. The impact of the buybacks should be to narrow the discount to NAV. NAV at 2166.7p has jumped 12.8% since FY17. Land Securities is the UK’s largest REIT (real estate investment trust) with a significant London, UK regional commercial property portfolio valued at £14.4bn. The business develops office and retail property for rental/ sale, recently completing a 3.1m ft² speculative development programme in London that commenced in 2010. Land Securities is also a major UK commercial landlord. Revenues over 2017 £382m were up 5.5% with adjusted EPS of 48.3p, Land Securities adjusted net assets per share were 1,417p down 17p as the company adjusted its values for the softer UK office market. Land Securities capital structure should benefit from recent bond re-financing which removed £690m of high coupon debt and replaced it with lower interest financing. The weighted average cost of debt has declined to 4.2% from 4.9%. The board is being cautious in the current market, expecting the commercial property market to be slightly weaker in the run-up to 2019. The consensus forecast suggests modest growth derived from interest savings, and development profits. The “Nova” building in Victoria is 54% let and the team are working hard to fill this substantial property by end 2017. Land has relatively low exposure to retail parks (5.9% of portfolio) a soft spot in UK property. This lends support to the view that the 1% decline in Land’s property valuation to £14.4bn over 2017 has limited further downside risk. The team is tracking around £2bn of development opportunities which are likely to be keenly priced in 2018. Land’s discount to net asset value is substantial post the UK election, at 1043p it is 26.4% against 2017 net asset value of 1417p.This seemly to overly discount the softer trend in weak UK commercial property. If you are looking for help and direction with your portfolio why don’t you book a free telephone appointment with one of our Investment Advisers.